Has anyone ever worked for VA hospital? I have worked in the VA for about 6 months or so now, but I work on the outpatient clinic side of it. I love what I do. :redpinkhe Occasionally I will get a bit of an oddball patient, but who doesn't. For the most part, the vets that I have worked with have been very courteous and grateful for the care. The pay is not the best, but the benefits are awesome. I have found that how happy you are here depends on what floor you work on, what department you work in, and your co-workers. The gears grind slowly and that can be very frustrating, but that is government work for you. Thank You! I really needed that laugh today! Scared Pre-Nursing Student: Is Nursing as Bad as I Hear? OK, I am going to throw in my , Nursing is a profession that we see the very best and the very worst in people. Most people just think that is limited to our patients, it's not. It is our patients, fellow nurses, doctors, CNAs, CMAs, NPs, etc... Our job is to deal with extremes of human nature and sometime it is really hard for that not to leave some sort of mark on you. Some days our jobs are so physically, emotionally, and psychologically draining and stressful that we need somewhere to go to vent to someone who has been there with us. It is not the side of nursing that most students consider when they are working to get that hard earned license, but it really does need to be acknowledged. I was always told that it takes a special kind of person to be a nurse. I see that is true now more then ever. 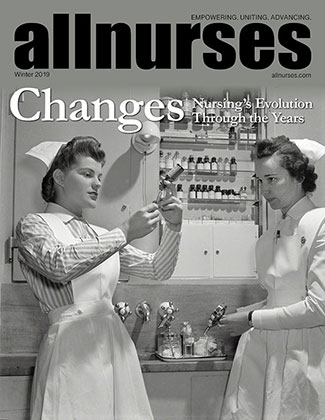 Most nurses now are feeling overworked, under appreciated, disrespected, and "dumped on". I have a feeling that a great majority of nurses have a genuine reason to feel this way. I personally love where I work and am lucky to work with a group of people that get along. I know that my team members have my back, just like they know that I have theirs. Right now that seems to be more the exception then the rule, and that makes me sad. I encourage anyone who wants to enter into the field of nursing. But I think that it is a decision that needs to be entered into with your eyes wide open. It is what you make it. What's the longest you would commute for a job?? I guess I have been lucky. My commutes have mostly been around 15-20 minutes. At my previous job there were a couple of nurses that had a little over an hour one way. "The Code Blue Disturbed The Other Patients" - Shame on you bad nurses! I just hope that if I am ever on the receiving end of a code that the staff makes as much noise as necessary to do their jobs effectively. No matter whom else it may disturb! We still use text paging for a lot of things. The doctors and the nurses have them. We have a certain way that we enter pt information so it won't be a HIPAA violation, and they monitor ALL the pages to make dang sure that we do it right. Which type of watch do you reccomend? http://www.target.com/Armitron-Lcd-Sport-Watch-Black/dp/B002DL4KCS/ref=sc_qi_detaillink This is the watch that I have. I love the holes in the band because I hate the feeling of my wrist still being wet after I wash my hands. I got it for around $20. I have gotten some compliments on it since it is a little unconventional. I usually spray it with some Lysol at least once a week and let it dry. I like to save my nicer watches for when I am off duty. I won't be heartbroken or just broke if I break or lose this one. When I got mine I had it engraved with my First Initial, Middle Initial, and last name. I intend to move further in my education in a couple of years and didn't want to have to order a new nametag. Besides my ID tag for work has my title on it already. What color is your stethoscope??? My husband gave me a Littmann Classic II SE in black as a graduation gift. It is engraved, and has managed not to disappear yet. My IV course was included in the curriculum at my nursing school. It is certified by the state and has to be a state approved program. We had to pass a written test and start a successful IV with the instructor watching. All of the course information was sent into our state BON and when we received our licenses (after graduating and passing NCLEX) it said that we were IV certified. Sometimes if you check on the BON website for your state it will have information posted for IV certification classes that are state certified and approved. She actually thought that she would not get caught because she was friends on Facebook with everyone except our office manager. She didn't think that anyone would actually show the manager the pics and explain that doctors don't give Cipro as a treatment for c-diff.